“‘This is the day the Lord has made.’ Fifty years of faithful, loving service. 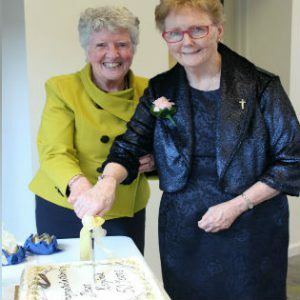 What a privilege it is for me to share this day with you,” Congregational Leader Sr Clare Nolan (right with Sr Regina) said at the celebrations to mark the golden jubilee of the profession of Sr Regina. 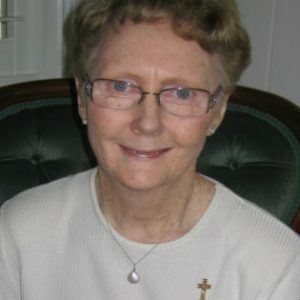 “When I reflect on the young woman who entered the novitiate at Wahroonga – hat, gloves and all – I remember a confident, quite prayerful woman. You recited poems at the concerts perfectly – The white magnolia tree is one I will never forget. “The two years we were together you deepened your spirituality and quietly, by being yourself, you were an example to many of us. “Profession came; you graduated as a nurse, a vocation within a vocation. It wasn’t long after than you were encouraged to enter the field of nurse education. I remember vividly you as the Clinical Nurse Educator teaching at the bedside with the new student nurses. Once again, those qualities of confidence, kindness, compassion, and excellence shone through. You were able to create in the nurses the wonder at the make-up and the function of the human body. “After 12 years, proud as you were to be art of an historic moment in nurse education, when it moved into colleges of advanced education, the ministry that you loved – the formation of nurses with Christian values – came to an end. From that ending came new beginnings. “In the spirit of our early days, the dream was to have a palliative care ward at St Joseph’s Hospital in Auburn. You developed a program in information for all the staff, the dream was realised, and still today this centre flourishes in excellence and care. Twenty years in the area of community palliative care, ministering to the spiritual needs of patients and families and being the spiritual carer on an interdisciplinary palliative care team, educating staff, volunteers, outside agencies, peers in the field, and local communities in spiritual care of the dying and in bereavement care, conducting rituals where appropriate. “I am overwhelmed to see where God led your and how He used your gifts and talents in the healing ministry and education. You live out your charism if bringing each person the love, tenderness and concern of Christ for the poor, seeing Christ in everyone we serve. You were happy because your were caring for the dying in the spirit of Mary Aikenhead. “And Regina you are more than that. You were and are the rock in your family. They love you and look to you to be ‘the wind beneath their wings.’ You were and still are there for them, bringing that special card, brightening up the room with flowers, bringing comfort, support and making each one feel special. When you say God bless you, people pause and feel it. It’s a special blessing, because you mean it. “You are a dear friend, sincere, kind, generous, and inclusive, you never forget birthdays, special milestones, you go the extra mile to point out beauty, beauty in the world, a drop of dew on a daisy, photography, an article written, beauty of the soul. The groups you gather that enable people to reflect and share life and love, their inner journey, is so appreciated. “So now you present ministry parish and formation. All through your life as a Sister of Charity, you have been in education and formation. Your education experience has spilled over into the parish and wider Melbourne in educating parishioner about palliative and bereavement care. “Mary Aikenhead said: ‘No great work was ever done for God except by persons of prayer.’ Rest assured that your work has been and is great because you are a woman of prayer and deep faith.